What is a Product Listing Ad? Product Listing Ads are ads that display more detailed information to users than standard text-based ads. Which encourages them to click through to your website. The information in the ads come from your product data feed. They are sometimes also referred to as shopping ads and can appear on various Google properties. Such as Google Search, Google Shopping, Google Image Search, as well as on the Google Search Partner network. You can also run a form of product listing ads on various other channels. Although, they normally have different names. For example, Facebook and Instagram call them Dynamic Product Ads. Some of the principles of how they work are similar to Product Listing Ads on Google. First, they are usually PPC ads so you only pay when someone clicks on your ad. Next, they are based on product data feeds. So, display products you sell with images and real-time price information. The crucial element in Google Product Listing Ads is the data feed. You upload your data feed to Google and then create your campaign. Google then decides which of your products to display to a user based on the content of your feed. For example, on a search results page, Google matches the information in your data feed with the user's search term. Then they decide which products to display in your Product Listing Ads. From the user's perspective, Product Listing Ads feature an image as well as an up-to-date price. They sometimes also feature reviews for the product. You can see the difference between a Product Listing Ad and a more straightforward ad by looking at a Google search results page. This example is a search for "montblanc pen". It returns several standard text ads, as well as several Product Listing Ads. The Product Listing Ads stand out on the page because of the size of the ads and the images. One of the key differences, from a management point of view, is the way keywords are used in Product Listing Ads. This is compared to other types of ads, particularly in search. With a standard text ad, like the Montblanc pen ads in the example above, you must list the keywords you want to compete for when setting up your campaign. However, you don't do this when running Product Listing Ads. Instead, Google matches your ad with a user's query using the information in your product data feed. Of course, it is still important to include keywords in your data feed. Particularly in the product title and description fields. However, you don't have to list target keywords when you create your campaign. Upload your product data feed to Google Merchant Center. DataFeedWatch can help by automating data feed updates and optimizing your feed. Create a new Product Listing Ad campaign in Google AdWords. Create Ad Groups to target specific products, product ranges, or product categories in your data feed. Higher click through rates - you can get more traffic to your website with Product Listing Ads, as your campaign will get more clicks. Higher conversion rate - your conversion rate will improve, as people clicking through will have already seen an image of the product and the price. So, they know exactly what they are clicking on. Wider reach - you can reach a wider audience when you add Product Listing Ad campaigns to your online marketing strategy. Enhanced visibility - because of the prominent display of Product Listing Ads and you can have multiple products appear on a single search or platform. Like other ad products from Google, you compete for the display of your Product Listing Ads in a competitive auction. That competition does vary depending on the type of product you sell. 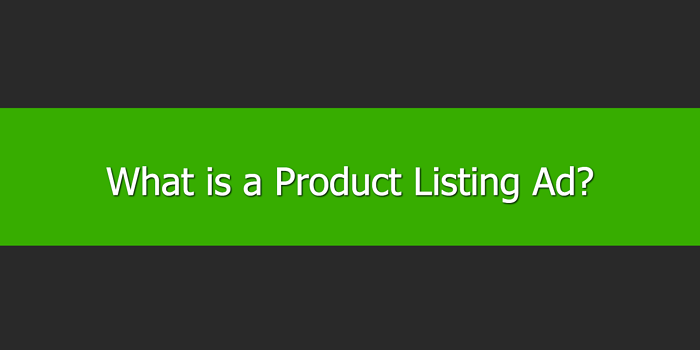 If you sell directly to consumers, you should use Product Listing Ads.